McHugh faces off with nationally decorated QLD based Sydney born icon Robbie Farr as the duo arm-wrestle over the two final rounds of the Ultimate Sprintcar Championship Queensland at Hi-Tec Oils Toowoomba Speedway. Effectively, there are two titles on the line. With a two-track three-round Easter weekend ahead McHugh and Farr are two of a horde drivers contesting both the Easter Tri-Series between Hi-Tec Oils Toowoomba Speedway and Ausdeck Patios Archerfield Speedway, and the Ultimate Sprintcar Championship QLD final two rounds at Toowoomba. Farr comes into the final USC QLD two rounds with an incredible record so far. Last weekend he finished runner-up in the USC NSW points to rival Sam Walsh. The weekend prior in Murray Bridge he successfully defended his Ultimate Sprintcar Championship South Australia. And now he seeks to successfully defending his USC QLD Championship. McHugh though, has other ideas. So too does 2019 Australian Sprintcar Champion Andrew Scheuerle. 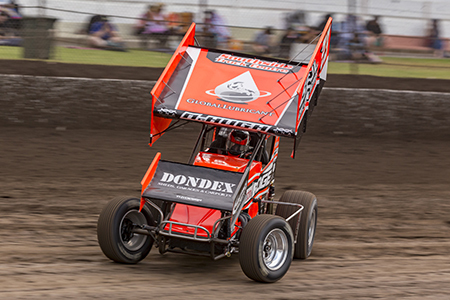 Scheuerle made a sporadic trip to Valvoline Raceway in NSW last weekend after a couple of seasons away from the iconic Parramatta venue and came away with a credible fourth place finish. It was a result that bolstered the Toowoomba local hero’s confidence and reminds him that he’s every bit a chance for stealing the USC QLD points lead from McHugh and Farr. 20-year old Bond University Lachlan McHugh (studying Actuary Science) has enjoyed some stellar moments and four feature race victories (all at Archerfield Speedway) in his third full season of competition in the distinctive bright orange #23 Triple X.
There’s every chance he could knock off his first ever Ultimate Sprintcar Championship QLD Series but the young gun and the racing veteran are remarkably tied on points coming into the weekend. This time last season he won at Hi-Tec Oils Toowoomba Speedway for the Easter weekend so he knows how to get the job done there. A tremendous 33-car field has entered for the Good Friday and Easter Sunday battles including eight interstate cars from New South Wales and South Australia. Two-times World Series Sprintcars and two-times Warrnambool Classic winner Steven Lines headlines the tremendous assault from down south for the Tri-Series battle royal. Sydneysiders Daniel Sayre, Jessie Attard and Mick Saller plus Daniel Cassidy (Newcastle NSW) Jackson Delamont (Young, NSW) Chris McInerney (Young, NSW) and Brendan Scorgie (ACT) have all joined the entry list.